Do you ever wish there were more hours in a day? Do you often find yourself under the pump, staying back late at the office struggling to finish your daily to-do list? Don't worry, there are apps that can help with that! We know that between answering emails, prospecting, completing paperwork, managing social media accounts, running inspections and fielding calls, property managers and real estate agents are regularly finding themselves pressed for time. Amongst this plethora of tasks and duties, if time management isn’t your strong suit it can be easy to lose track of important tasks and enquiries, and not work as productively as you could or should be. Research shows frequently being time poor can lead to increased stress, sacrifices to work quality and missed business opportunities. Here are five apps that’ll help you get more out of every day. If you fall victim to hundreds of emails flooding into your inbox aka ‘email overloard’ daily, Spark is the email add-on for you! You can set up your unified Smart Inbox with existing Gmail, Exchange, Yahoo or Outlook accounts to have all your emails combined in one handy place. The best thing about Spark is it intuitively prioritises your emails into groups (personal, notifications and newsletters) and puts the most important ones at the top of your inbox for immediate attention. It also provides you with Smart Notifications, so you only get notified about the most important messages. WhatsApp is a fantastic free tool to communicate with clients and team members. Use group chat to make announcements, share videos, images and delegate tasks to colleagues. Also, save time by taking photos of your open for inspection forms to send directly to an admin assistant for input into your CRM system. This simple action will save you from having to hold onto the hard copies of all your lead sheets from the weekend and ensure you're ready to make follow-ups first thing Monday morning. One of the easiest ways to break down a lengthy to-do list into more manageable bite-sized chunks is with Any.Do. You’ll never forget or put off an important task again with the app’s time and location-based reminders, voice capture capabilities (great for when you’re out and about) and recurring event capabilities. You can also share lists and attachments, as well as chat with and assign tasks to other team members within the app. Any.Do syncs across Android, iOS, web and desktop devices and works seamlessly with Google Calendar, Exchange and iCloud. Take back hours of your week using a social media scheduling and management service such as Hootsuite. You can now save more time than ever, where since early 2018 Hootsuite has allowed users to schedule automatic Instagram posts. Posting to Instagram, Facebook, LinkedIn and Twitter multiple times a day without the hassle of having to manually upload posts will save you loads of time. You can also keep track of your performance on each of your professional platforms using Hootsuite’s analytics, to get a better picture of what your audience is and isn’t engaging with. RP Data Pro ensures you’ll have everything you need in the palm of your hand to wow potential clients at inspections, appraisals and while you’re out and about. You can research market trends, comparable sales, generate valuations, create and send postcode reports all from the convenience of your mobile. 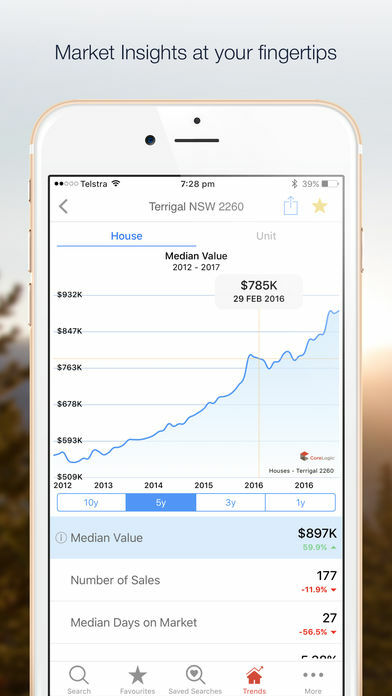 CoreLogic also provides complimentary training with every app purchase so you can learn how to maximise the wealth of property info you’ll have access to. The app is available for iOS & Android. We hope these apps aid in putting some of your time management pain points to bed and help maximise your precious working hours. For more ways smart technology can boost your professional success take a read of what’s new in real estate tech and eight productivity boosting tools. Disclaimer: The information provided is a general guide only. Homely has no association or interest in any of the apps or their affiliates mentioned above.